Mid-level producers, smaller steel and metals service centres have started to feel cash flow and profit margin pressure after the imposition of tariffs. According to the World Steel Association, US steel production increased 4% in 2017 and in the period January-August 2018 respectively. US steel demand is forecast to increase about 3% in 2018 and 2% in 2019, after a 6.4% increase in 2017. Last year US steel and metals businesses benefited from tax cuts on corporations, which allowed companies to expand their infrastructure and increase investments. The imposition of import tariffs on steel and aluminium by Washington in spring 2018 has resulted in adjusted pricing in the US market. 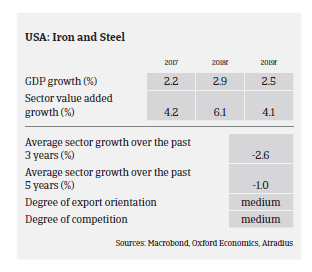 This has led to increasing revenues and improved profitability for US steel and metal producers, as domestically produced steel and metals is now less expensive than imported products. 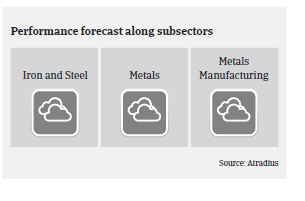 That said, depending on the level of international sourcing, mid-level producers, smaller steel and metals service centres and end-buyer sectors have started to feel cash flow and profit margin pressure related to the working capital lag associated with the higher prices (especially for steel and aluminium). The new tariffs have made US steel and aluminium products a “first choice” of purchases, but at the same time many foreign producers offer specialized products not readily available in the US. Historically US-made steel and metals items have been produced at a higher cost compared to imports. This means that many steel/metals trading or processing businesses in the US need to pay the additional tariff amount or higher prices for domestic products, but cannot pass the cost increase on to their costumers/end buyers in the short-term, because of existing contracts in place. Even after those contracts expire in 2019 the main issue for businesses importing steel and metal products will remain the ability to pass on increased costs to end buyers. The steel and aluminium tariff issue could potentially have an adverse impact on the US economy itself, especially on major steel/metals end-buyer sectors like automotive, construction and consumer durable goods (major kitchen appliances such as refrigerators and stoves/ovens). All those segments are highly dependent on steel and metal (especially aluminium) products, often sourced from abroad. Not passing on tariff-related price increases would affect businesses financials, while passing them on to end-consumers could reduce demand. For instance, it is expected that the automotive sector will reduce the production of new models due to lower consumer demand triggered by higher end-prices. In the construction industry, higher steel and metal prices could delay new projects. In order to meet budget targets financiers and builders could reduce the size of projects. The average payment duration in the US steel and metals sector remains, on average, 30-45 days domestically and 60-90 days for businesses abroad. Payment delays and defaults have decreased in 2017 due to the improved performance seen last year. 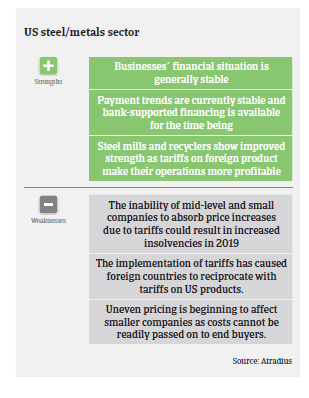 However, as the consequences of import tariff have begun to impact certain segments a slight increase in steel and metal insolvencies in the coming 12 months cannot be ruled out, especially as smaller players cannot afford to pay higher prices for tariff-related products. 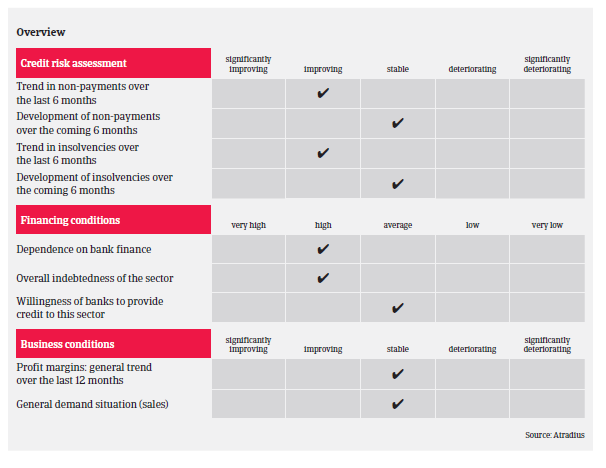 Our underwriting stance for the steel and metals sector is generally neutral. While businesses like steel mills and recyclers are benefitting from the import tariffs, steel and metal traders, service centres and processors are struggling to digest higher costs, not being able to pass on the increase to end-customers for the time being. Therefore, each buyer must be reviewed on a stand-alone basis. We seek a clear understanding of each buyer’s domestic/international revenue split and the dynamics of their supply chain. Potential taxes on chemicals-related imports could find US chemicals businesses paying more for feedstocks and would negatively impact supply chains. A deterioration of trade relations with China could negatively affect the ICT component supply side and confront US end-consumers with higher sales prices. Some caution is still advised on businesses dependent on the oil/gas and the mining industry, due to potential impacts of energy price volatility.